namaḥ—I offer my respectful obeisances; te—unto You; nara-siṁhāya—Lord Nṛsiṁhadeva; prahlāda—to Mahārāja Prahlāda; āhlāda—of pleasure; dāyine—giver; hiraṇya-kaśipoḥ—of Hiraṇyakaśipu; vakṣaḥ—chest; śilā—like stone; ṭaṅka—like the chisel; nakha-ālaye—whose fingernails. itaḥ—here; nṛsiṁhaḥ—Lord Nṛsiṁha; parataḥ—on the opposite side; nṛsiṁhaḥ—Lord Nṛsiṁha; yataḥ yataḥ—wherever; yāmi—I go; tataḥ—there; nṛsiṁhaḥ—Lord Nṛsiṁha; bahiḥ—outside; nṛsiṁhaḥ—Lord Nṛsiṁha; hṛdaye—in my heart; nṛsiṁhaḥ—Lord Nṛsiṁha; nṛsiṁham—Lord Nṛsiṁha; ādim—the original Supreme Personality; śaraṇam prapadye—I take shelter of. Nṛsiṁhadeva may save you. Lord Nṛsiṁha, prahlāda āhlāda-dāyine. And to the Hiraṇyakaśipu, śilā-ṭaṅka-nakhālaye. Both ways Kṛṣṇa is protecting. 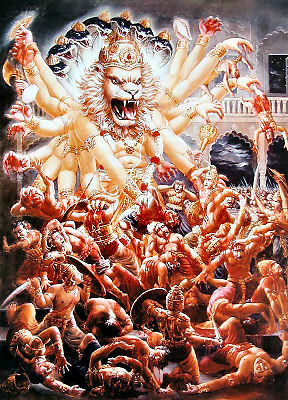 And Viṣṇu, you see He has got four hands. In two hands He's carrying śaṇkha, cakra and in two hands gadā, padma. This śaṅkha and padma is for the devotees, and gadā and cakra for the demons. Kṛṣṇa says in the Bhagavad-gītā, yadā yadā hi... paritrāṇāya sādhūnāṁ vināśāya ca duṣkṛtām [Bg. 4.8]. He has got two business. To give protection to the devotee and to kill the demons. But the result is one. 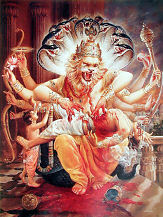 He does good to the demons by killing him and He does good to the devotees by giving him protection. 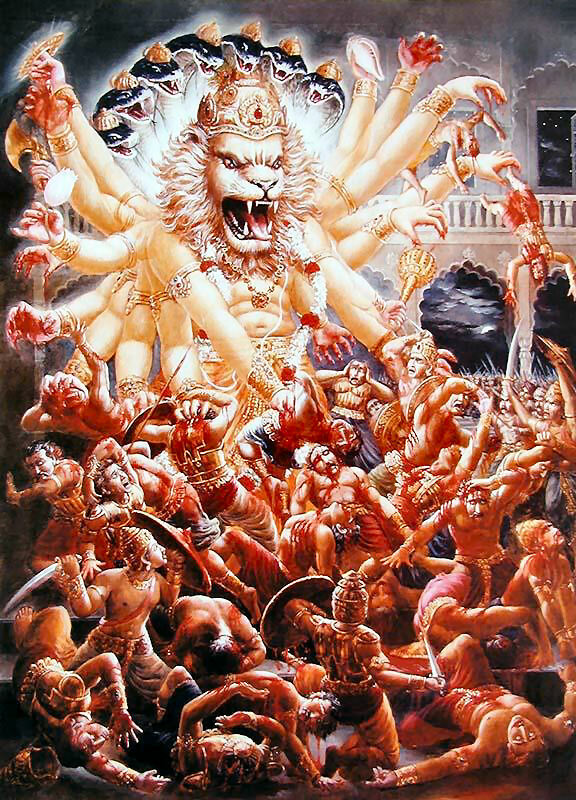 Nṛsiṁhadeva will give you protection in my absence. I am now going to Japan to get some books printed personally and after that my program is to go to India. Maybe I shall be able to establish some temples there. 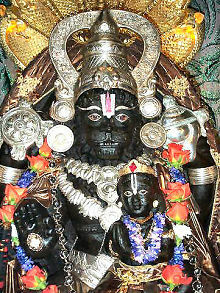 Of course in India there are many temples, but it does not mean that I shall not also establish some temples. Just like there is overpopulation. It does not mean that one should not beget child. Similarly, there may be many hundreds of thousand temples in India, still our this society, ISKCON, should have their own temples. That is the way since time immemorial. There are hundreds and thousands of temples. So my advice to you, I am old man. So even I may not return, you shall continue this Kṛṣṇa consciousness movement. This is eternal and I shall request you to keep the standard as I have already given you the program. 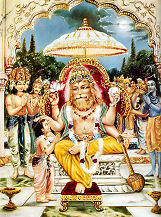 The Deity worship, the kīrtana, the street saṅkīrtana, distribution of literature, books. You should carry on this program with great enthusiasm. That is my request. Hiraṇyakaśipu was an atheist who denied the existence of God, but God came as Lord Nṛsiṁhadeva, a half-man, half-lion incarnation, and killed him. Therefore praise is given to the Lord as supreme controller of the universe and all living entities (jaya jagadīśa hare). "The fourth incarnation is Nṛsiṁhadeva. Nṛsiṁhadeva appeared to save Prahlāda Mahārāja, who was five-years-old boy and he was being tortured by his atheistic father. So He appeared from the pillar of the palace as a half-man, half-lion. 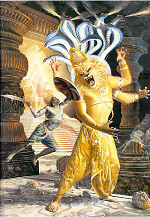 Because this Hiraṇyakaśipu took benediction from Brahmā that he'll not be killed by any man or any animal. So the Lord appeared neither man nor animal. This is the difference between the Lord's intelligence and our intelligence. We are thinking that we can cheat the Lord by our intelligence, but the Lord is more intelligent than us. This Hiraṇyakaśipu wanted to cheat Brahmā by indirect definition. First of all he wanted to become immortal. Brahmā said, "That is not possible because even I am not immortal. Nobody in this material world is immortal. That is not possible." So Hiraṇyakaśipu, the demon... The demons are very intelligent. He thought that "Round about way I shall become immortal." 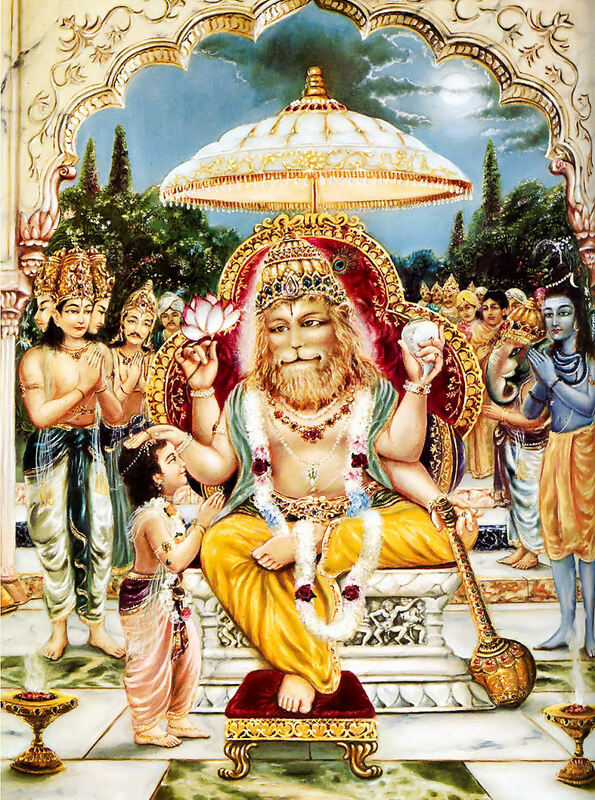 He prayed to Brahmā that "Please give me the benediction that I shall not be killed by any man or any animal." Brahmā said, "Yes, that is all right." "I shall not be killed in the sky, on the water or on land." Brahmā said, "Oh yes." "I shall not be killed by any man-made weapons." "That's all right." In this way he utilized his intelligence in so many ways just to come to the conclusion of being immortal. But the Lord is so cunning that He kept intact all the benediction given by Brahmā, still he was killed. He said that "I'll not be killed either during daytime or night." Brahmā said "Yes." So he was killed just in the evening, just in the junction of day and night. You cannot say it is day or night. He took the benediction that "I shall not be killed in the sky, on the water, on the land." So he was killed on His lap. He took the benediction that "I shall not be killed by any man-made or any God-made weapons." That was given, "All right." So he was killed by the nails. In this way, all the benedictions were kept intact, still he was killed. Similarly, we may make plan, we may make very advancement in scientific knowledge, but the killing process of nature will be there. Nobody can escape. By our intelligence we cannot escape.